Need more reasons to visit? Check out Abilene in the News! 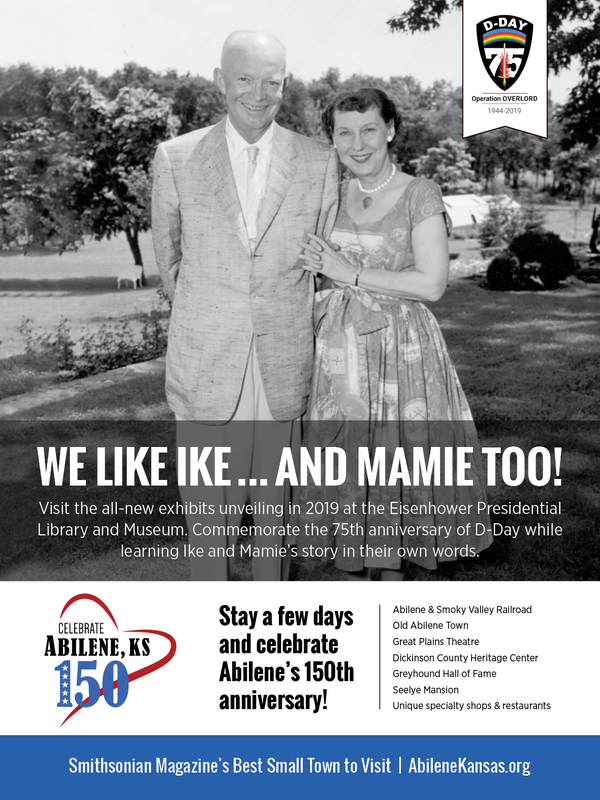 Find out all Abilene has to offer to its residents and visitors. 2019 calendar of events as of 1/23/2019. Find information on renting our facility in the restored Union Pacific Railroad Depot. Find franchise and uniquely Abilene eating establishments in the area. Find hotels, motels, bed and breakfasts, and more. Request publications, visitor guide, shopping and dining guide and others. Find antiques and artisan shops in the area. Abilene, Kansas is located on Interstate 70, 2.5 hours from Kansas City and 90 minutes from Wichita. The following list of transportation services will help you get to and around Abilene. If you have questions, call 1.800.569.5915. If you are coming to do research at the Eisenhower Presidential Library, call us and we will assist you in making travel arrangements! Need help planning your trip? Call us at 800.569.5915 or 785.263.2231.